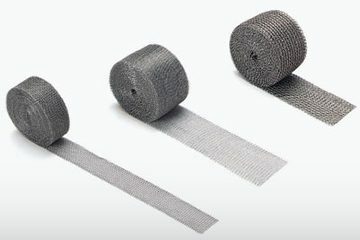 Knitted (or woven) wire mesh and tape has a number of applications but is used mainly for EMC / RFI screening of electrical power, control, data and communication cables and for earth continuity in cable joints. In addition, the springy nature of the tape lends itself to providing a mechanical cushion against adjacent surfaces. Application is both quick and simple. The wire mesh tape is wrapped around the item to be protected to give a 50% overlap that produces 4 layers of screening.